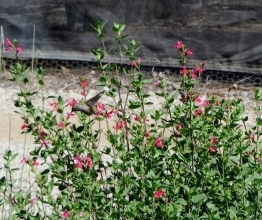 Red flowering sage-native of New Mexico, Mexico, and Arizona.Will grow in full sun or shade. In sun will flower from spring through fall. In shade will flower in spring and then again in fall. When established can handle extra watering or not. Red tube flowers favorite of hummingbirds, bees, and butterflies. Size 3′ x 3′.